What exciting prospects lie ahead because you can rightly look forward to some revealing times, and positive indications that the long awaited changes are coming to fruition. We appreciate the reasons for your caution, and feel sure that given time you will have no doubt that you are leaving the old Age cycle behind. It has run its course and there is no way back for those of the dark forces who have supported it. Naturally there will still be obstacles to overcome, but their ability to maintain it has been sorely diminished. You can expect them to try and prevent the news becoming widespread, but it is of such importance that we will not allow it to be stopped or interfered with. There may be minor problems, but you may be assured that a wonderful future is assured. The time selected for the announcement has obviously been chosen with the holiday period in mind, so that as many people as possible can be reached. Families can gather together and discuss the implications of the coming Cities of Light. It should bring about a great upliftment in people’s hopes and faith in the future. Your experiences have been closely followed since the beginning of the cycle some 26,500 years ago. You have been guided to follow a path that would give you the needed experiences to hasten your evolution, and also opportunities to rise up above the lower energies. The End Times were always subject to your choice of which direction to go in and we are pleased that sufficient souls of the Light have been successful. They may not have been a majority, but their ability to bring the Light through has been sufficient to overcome the dark energies that would have destroyed them and taken full control. After having to stand by your beliefs – often with little proof – you at last have something to back you up, and as time passes it will become even stronger. Some souls will still find it difficult to understand the meaning of what is happening and will carry on in their old ways. That is fine inasmuch that each one of you must follow your own intuition, and decide your own future. In fact you cannot simply elect to move further into the Light than your own vibrations will allow. You must therefore allow others to define their own needs and path to follow. Be assured that all souls will eventually find themselves exactly where they are intended to be. This will allow them to proceed with their evolution in a manner that is appropriate to their level of understanding. In the long term all souls will rise up, since in reality there is no time such as you understand it. The higher levels are not bound by time and souls can move backwards and forward within it. On Earth the news of the Cities of Light will cause a great stir and give the people great hope for the future of Mankind. Hitherto the future looked grim with chaos seeming to get worse and with little hope of any changes for the better. As you have been experiencing, the End Times can be quite volatile as the old energies play themselves out. However, nothing will stop the full manifestation of the New Age that has already commenced. What is to happen will give people great hope for the future, and many advances that you have heard of can soon become part of your reality. Although you have been held back by the dark Ones, the fact remains that progress has still continued where new inventions have been made that will make life a lot easier. “Lack” will eventually become an unnecessary word and there will come a time when poverty will become totally eradicated. Hunger and lack of the material needs that make life more acceptable will no longer apply, as there will be ample supplies of all the necessary things that can bring it to you. Dear Ones, by now you should have a good idea of where Humanity is heading, and it will make up for the many less acceptable experiences that you have had. All has of course been in the interests of your evolution and have been planned from one life to another, so that you have kept on rising up and raising your vibrations. For those souls that have been unable to do so, there are no recriminations but simply more opportunities given to succeed another time around. As you have often been informed, at all times you have had assistance and never been left alone to fight your battles. It may seem otherwise but please remember that we can advise you and work with you, but the final path you take is your decision and who are we or indeed anyone else to interfere with your choice. Considerable karma is accumulated on Earth by those who believe in revenge for acts against them. It is in fact a way that brings you more karma, because nothing is ever gained by such acts. Each soul has to face themselves and their acts when the mortal life expires. It is of course difficult to become passive in a violent world, but bear in mind that all of the time you are creating your own future. If you are a soul of Love and Light that has reached the level of one who can express “love” in all circumstances, then you are surely ready for your Ascension. However, do not despair as there are different levels within all dimensions, and as long as you lead your life based on loving your brothers and sisters, you will succeed and rise up. 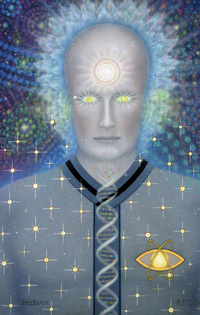 I am SaLuSa from Sirius, and happy to be able to give the good news about the Cities of Light. They have been slowly manifesting for quite some time and it will be a wonderful sight when they do. They will attract thousands of visitors but we suspect that initially its appearance will be as you say “dumbed down”. However, the Cities are quite large and there will clearly be enormous interest in them. The authorities will not be allowed to interfere and adequate precautions will be made to give it full protection. Be In Love and Light and know you are blessed to be present on Earth at such an important time.